Vernier or Caliper is a technological device that increases the sensitivity of a measuring instrument, to subdivide the lower division it. In this simulator the vernier or vernier (rectangle below the scale) has forty spaces between the vertical lines. This means that it divides by 40 to 0.040in size (forty micro inch) which is the smallest division of the main scale. 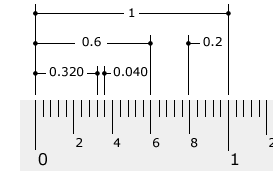 In this simulation, the vernier or vernier scale is low, which slides on the main scale (fixed) measuring magnitude “inch” which is divided into five (the space between the long marks – 0.2in) which are also subdivided for five (the space between the short marks), totaling 25 divisions per inch or 0.040in) -figure 1.
the measurament we’re taking is higher than 7 in and lower than 8 in. Scroll down and practice these skills.